Identification: Small—1.4" (much larger than American Copper). Sexes similar below. Above: Male FW dark with purplish sheen when fresh, and HW with wide orange band along margin. Female FW differs in having large, yellowish-orange patches with prominent dark spots. Below: FW orange with small dark spots and grayish trailing edge. HW gray with dark spots and a wide orange border along trailing edge. 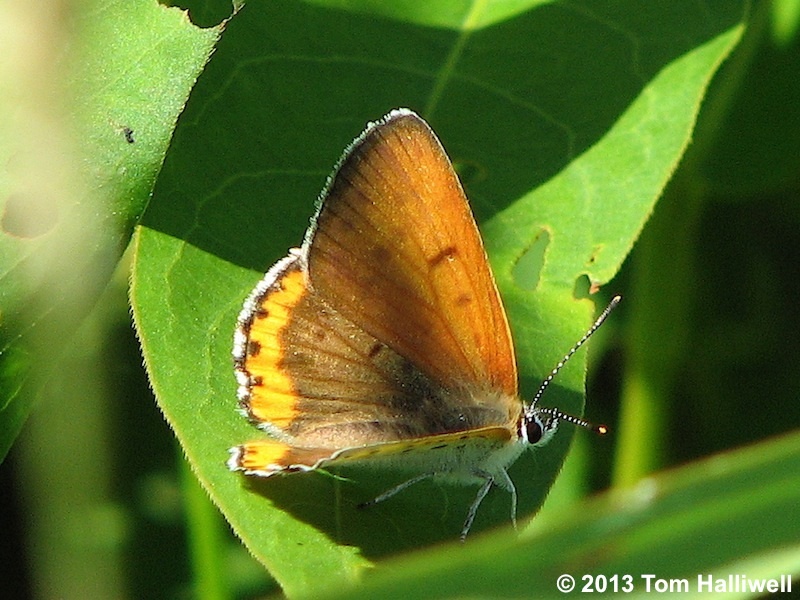 Similar species: American Copper is smaller, brown and bright orange above, and has a much narrower orange band along trailing edge of HW below. NJ Status and Distribution: Resident. Classified as Endangered in NJ. Recently reported from Sussex, Warren, Salem, Cumberland, and Cape May counties. Habitat: Open, often wet, often disturbed (even agricultural) habitats. 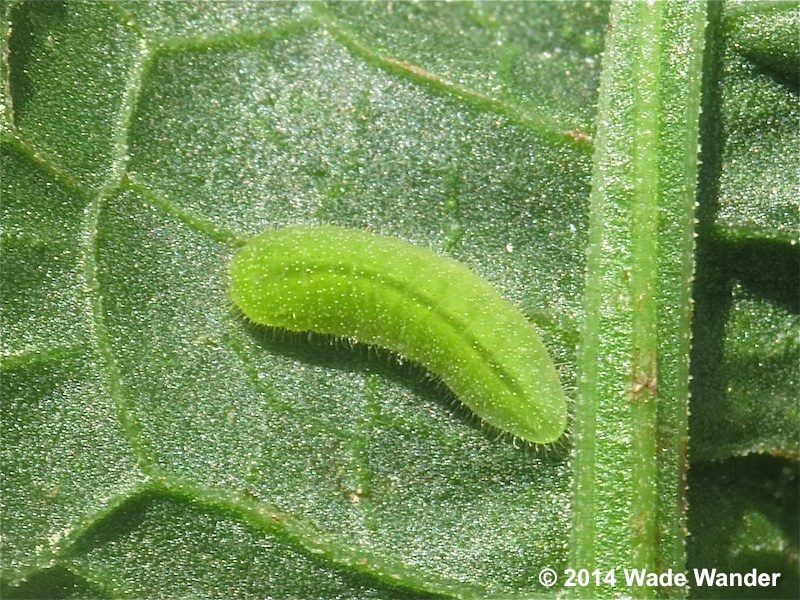 Typically found near dock plants (genus Rumex). In Sussex County, this species has been found at several sites in, or very near, floodplains in the Wallkill River drainage. Not your typical garden species because of its rarity. Flight Period: Three somewhat overlapping broods from early June to late September with peaks in June, mid-summer, and late summer. Extreme dates: North Jersey 6/6—10/11; South Jersey 5/23—11/12. Larval Food Plants: Docks such as Curled Dock (Rumex crispus), Great Water Dock (R. orbiculatus), and Water Dock (R. verticillatus). Curled Dock is especially common and widespread, so Bronze Copper does not appear to be host-plant limited. Best Locations: None listed because of endangered-species sensitivity. Comments: Like the mythical Pooka of the classic movie “Harvey,” Bronze Coppers turn up here and there, and now and then. Most known sites support from 1-5 or so individuals and have proven to be ephemeral. 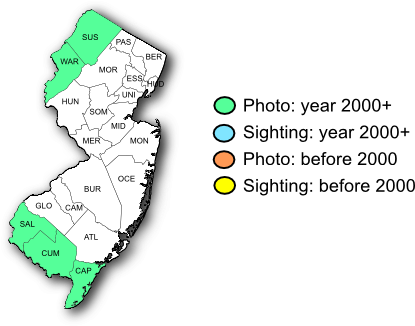 Observations, especially with photographs, should be reported to the NJ Endangered and Nongame Species Program and to the NABA-North Jersey Butterfly Club. Male, Sussex Co., NJ, 6/23/07. 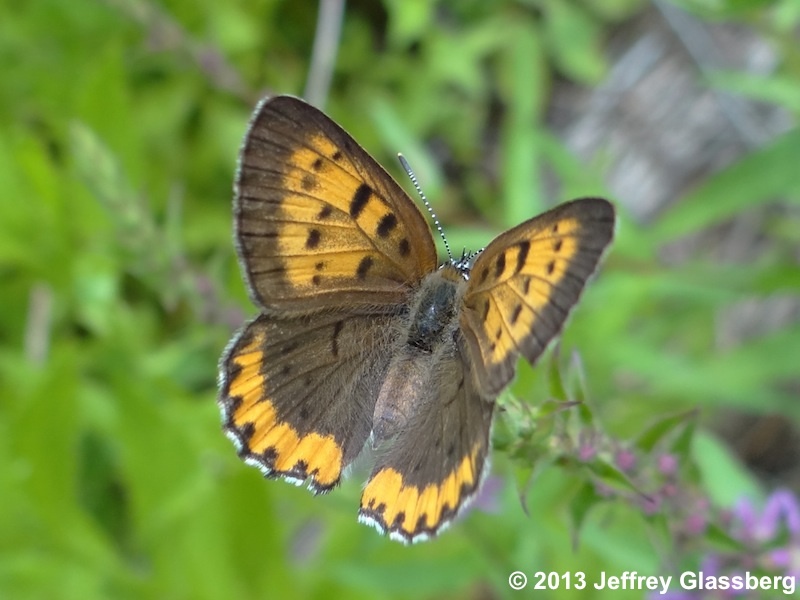 Female, Sussex Co., NJ, 8/3/11. 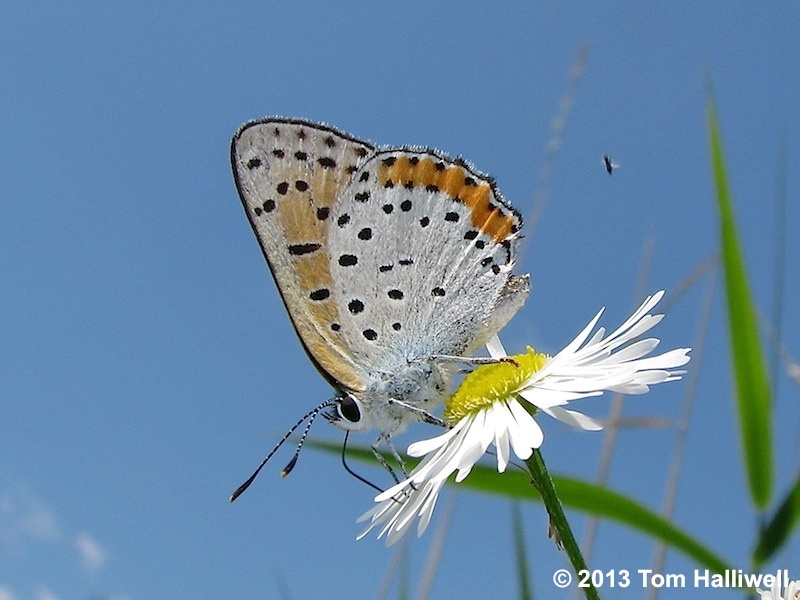 Sussex Co., NJ, 8/2/11, on Daisy Fleabane. Great Water Dock (Rumex orbiculatus). 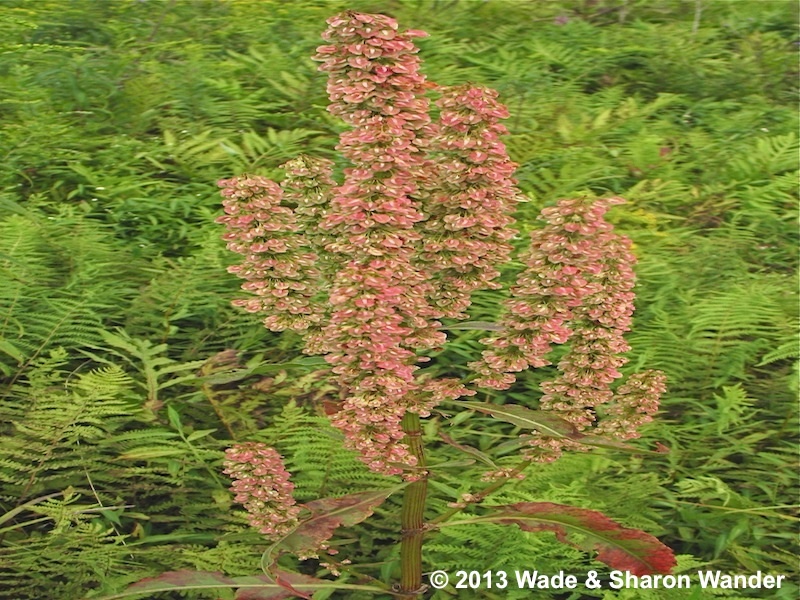 This obligate wetland species is a native host plant for Bronze Copper.